Trafalgar Tavern | Pub Quizzers | Find a pub quiz near you, now. 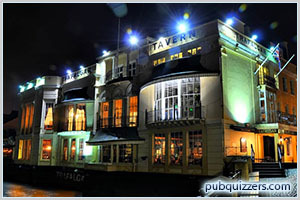 Pub quizzes take place at Trafalgar Tavern, Greenwich on Mondays (occasionally) at 19:00. Entry is £5.00, you can have up to 6 people on a team. There are prizes of spot prizes. Happy quizzing! To mark the opening of the Nelson, Navy, Nation gallery, indulge in some friendly competition and test your knowledge of the Battle of Trafalgar, in the comfy surroundings of the aptly named Trafalgar Tavern overlooking the Thames. 5 per team (no more than 6 people).